When taxpayer abuse is this blatant, it’s easy to see. Most abuse is much harder to find. 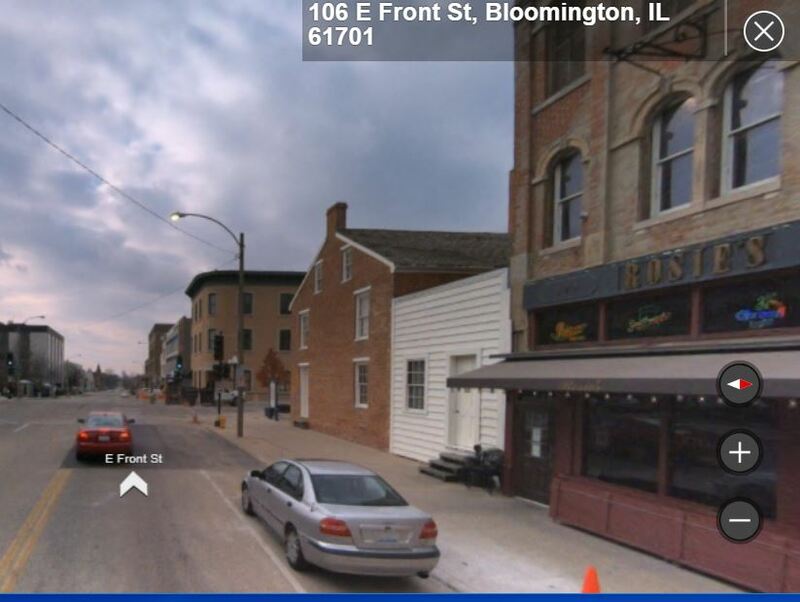 This picture is from Google maps. 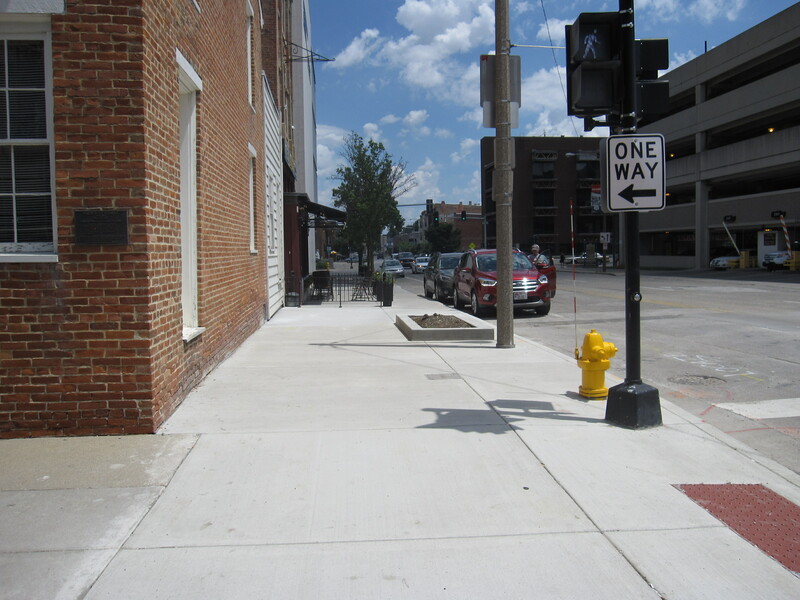 Note the sidewalk is perfectly flat – this is along Front Street in front of Rosie’s. One more picture taken this afternoon – again look at the sidewalk. Not only is there new concrete, one of the concrete planter boxes is now gone. I don’t know whether to believe it, but I heard bicycles were crashing into the one closest to Rosie’s cage, so it had to go. The cage looks a little better today, some flowers have been added. How much do you think it cost to put the planter box in and then rip it back out? Why is a lot of new concrete around Rosie’s? 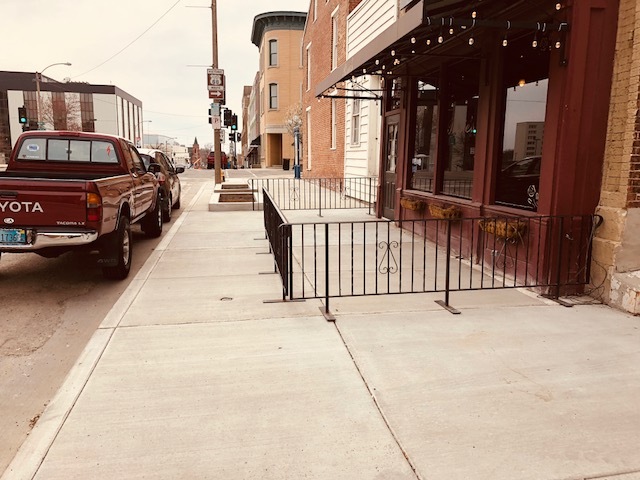 Did wrecking the second planter box destroy the sidewalk too? More on downtown tomorrow! Yes, I did a tour. Posted in BloNo, Bloomington, budgets, Local, Progressives, Renner, Taxes.Tagged Downtown Bloomington, government waste, planter boxes, Rosie's Pub. The Upittytown parking fiasco is what happens when the city idiots hire too-smart-for-their-own-good Californian designers who have never met a midwestern winter! I could never understand why the overpaid and overbeneffited city employees need to hire outside consultants to do the job we are paying them to do? Can you say kickbacks???? I think Moe, Larry and Curly could do a better job that our cities’ Bozos…. Hey, Larry. Instead of fighting all of your battles from behind a keyboard…which accomplishes nothing, do something! Run for office, support a candidate by knocking on doors or calling voters, or create an advocacy group! But no…that would 1) require you to actually take action, and 2) cut down on the amount of complaining you so love. IF I EVER entertained a thought about eating at Rosies, that has DISAPPEARED. That “railing” is so tacky that it should be hauled to the junk yard. BOYCOTT the place! I sure will. Ok that’s it, I am going to brave Downtown tomorrow, guess I could eat at Poblano Burrito so it’s not a total let down. That outdoor are has been there for years. It does look better with flowers! It’s been there because Bloomington doesn’t think adults are capable of policing themselves. The lunch crowd is out of control! Still won’t be going downtown to eat; plenty of choices north and east of Route 9. Can’t see FACTS in the Pics? Good job! You must think public officials will tell the truth. You need to read more articles. hint: they don’t, I’m not the Pantagraph that only prints their press releases. Don’t know until you ask. Maybe you’ll catch him in a lie! Would good would that do? We have the Pantagraph and WGLT to report on your “News” – so go there if that is what you want. This is a place for the people who are outside the establishment narrative. And many people who comment here are just regular people who are tired of the elitist overpaid snobs who have ruined our nice little towns. They are tired of ideology over practicality, the we know better that you mentality and continued focus on spending public money to fix macro economic problems. News has things like “sources” with “attribution” and “facts” and stuff like that, Larry. This blog? It ain’t news. Sorry to break it to you. And if you don’t like it around here…have you thought about moving? I mean, you might be a happier person in the long run. Please, try to have a good day…and put a smile on that angry face. Later! Yep, I photo-shopped the pics. Sure. The brain-dead in the swamp will never understand the truth. He doesn’t, common sense can’t be refuted. Pics help tell the story. They are NOT the story. Who’s brain dead (insert eye roll)? You are so funny! Yep, pics aren’t evidence. We know who is brain dead. Just and FYI – Rich is experiencing the classic signs of cognitive dissonance – here is the definition if you are unfamiliar with it: “In the field of psychology, cognitive dissonance is the mental discomfort (psychological stress) experienced by a person who simultaneously holds two or more contradictory beliefs, ideas, or values. The occurrence of cognitive dissonance is a consequence of a person performing an action that contradicts personal beliefs, ideals, and values; and also occurs when confronted with new information that contradicts said beliefs, ideals, and values.” In this case in confronting Rich with something that is contradictory to his personal beliefs causes him (because they are truths) to lash out at me personally (and all of us) rather that rebut what he can’t defend. Rich how do you know what you think you know you know ? Next Post Karma for David Hales!